Professor John V. Guttag, Head of the Department of Electrical Engineering and Computer Science (EECS) at the Massachusetts Insitute of Technology (MIT) has announced that Professors Qing Hu and Gregory W. Wornell of the Research Laboratory of Electronics (RLE) have been promoted to full Professor (from Associate Professor with tenure) effective 1 July 2002. Professor Hu is a member of RLE’s Optics and Quantum Electronics Group. He received the B.A. degree in physics from Lanzhow University (Lanzhow, China) in 1982, and the M.S. and Ph.D. degrees in physics from Harvard University in 1983 and 1987, respectively. From 1987 to 1989, he was a postdoctoral research associate in the Department of Physics at University of California at Berkeley. His research interests are in the physical and engineering aspects of high-frequency (greater than 100 GHz) and high-speed (faster than 10 ps) electronic devices. Specifically, his current research activities focus on the physics and applications of high-frequency (>100 GHz) and high-speed (<10 ps) electronic and optoelectronic devices, including semiconductor quantum devices, quantum-well THz and infrared lasers, and micromachined millimeter-wave and infrared sensors. Professor Wornell is a member of RLE’s Digital Signal Processing Group. He received the B.A.Sc. degree (with honors) from the University of British Columbia, Canada, and the S.M. 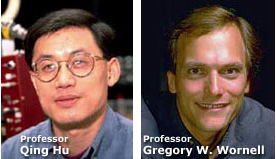 and Ph.D. degrees from the Massachusetts Institute of Technology, all in electrical engineering and computer science, in 1985, 1987 and 1991, respectively. His research interests span the areas of signal processing, communication systems, and information theory, and include algorithms and architectures for wireless networks, broadband systems, and multimedia environments. He is also active in industry, serving in different capacities from consultant to board member, and an inventor on numerous issued and pending patents, including several in the area of digital watermarking and information embedding. He directs MIT’s new Center for Wireless Networking, which is funded by the HP-MIT Alliance.